ABOUT FASHION: A NEW AGE IN CATWALKS? Would you like to be a model? Who doesn't! Being a beautiful woman whith long legs and a radiant body. But if you start to think about it, about how they live, about if they have an attractive body (they're extremely thin) you're going to realize that you aren't that perhaps this isn't what you really want. In conclussion, if we said that we want to be a model I think it's because of their fame, about the fact of being admired by everybody. Nowadays, the rules in fashion are starting to change. You will mostly find out people who are against models' lifestyle, from people who you would think would admire it. And that had a little repercussion to catwalks managers. Thay are starting to find the same skiny models as always, but they realized that models that are popular now aren't like the rest. They're not perfect, cute and full of make up. They're natural, without trying to hide their natural beauty or imperfect features: they don't try to fit in, trying to be accepted just being how they are. The saddest part of this movement is that it's just starting and there're just a few models who arrived to worldwide fame, like Cara Delevigne. 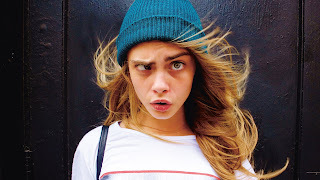 A model who's not affraid of doing silly things in front of the camera whithout make up on. The most interesting thing about her is her big brown euebrows. She might not be as pretty as the other models, but that's what make her enchance and the reason why she's famous now. Although there're things that are changing, it may not be a step, maybe it's just going to be a temporary trend. I'm not against skiny models, but I think that this isn't fair. It shouldn't have to exist a definition of what's beautiful and what's not made by human decisions. That's why I think that not all the models have to be skiny with "perfect" faces. Variety should have to be the definition of beautiful.